Here's a quick card I did for my friend Emily - Happy Birthday, Em! I used to babysit her ... now she's 20!! I'm really old! I'm pleased with how it turned out - again it would be better if I took a pic - you could see that it is one of those cute tent cards and the bella stands up ... oh well - you get it, right?! 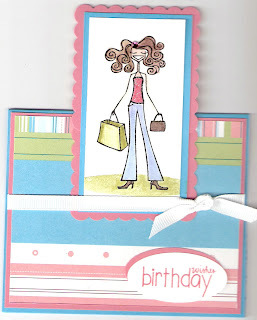 Stamps by Stamping Bella and A Muse, CS & paper by SU!, punches by Marvy and SU!, ribbon by SU!, bling by A Muse.